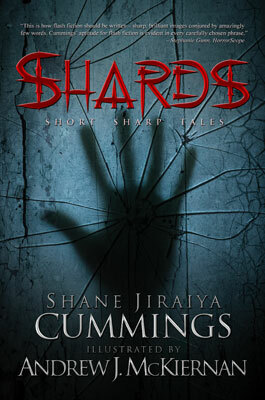 Shane Jiraiya Cummings was kind enough to send me a .pdf file of this wonderful collection of short fiction. Shane has close ties to the Australian Horror Writers Association, and the skill shown in writing these shorts proves he has the chops needed. There are seven distinct sections, each subtitled to summarise the general loose theme of the tales therein, from personal demons to sacrifice, from obsession to the apocalypse. I enjoyed every one! Shane’s writing is deep and thought-provoking, maintaining a thin veneer of civilisation but hinting at the darkest depths of fear and the human condition. He writes like a good surgeon operates; with as little as necessary, no waste, no excess. Every word has a place, and there’s a place for every word. The stories work on a bigger level, each one leaving you with the feeling that there was a complete tale there, no matter how short. This isn’t always the case; some writers work shorts like parts of a longer piece, giving you fragments of the story and leaving you to figure out the rest, but Shane gives you totality. You leave his writing feeling dirty, but at least you don’t feel used and left wanting. Shane Jiraiya Cummings’ writing style also works on a smaller level within the story. Seemingly innocuous sentences and phrases have a way of biting you while reading, and small sentences take on a leer of insanity when you realise just where they lead. All up a great release from Brimstone Press. Along with the high quality of writing inside this nicely presented volume, Andrew J. McKiernan has done a damn fine job on the illustrations that are presented for each story. Each picture sets the mood well for its written counterpart, sometimes complimenting the story, while at other times almost expanding or adding to the tale that follows. McKiernan shows a brilliant sense of what stands out in the mind of a reader, and then brings those images to life with a frightening style and ability beyond most artists working today in the smaller presses. If the book was worth getting because of the writing, the artwork contained within is the icing on the cake…and it’s that really nice icing we all love…you know, the one your Mum used to let you lick from the spoon when you were younger? This book is a shining example of the quality of art and dark literature coming out of the Australian continent, a quality the rest of the world is just beginning to understand. Aussie, Aussie, Aussie, Oi, Oi, Oi!! !